Blue Ridge, Ga. – Comments made at a recent Fannin County Board of Assessors meeting led to misinformation being spread throughout the public about county employees having to work overtime without pay. Fannin County Chief Appraiser Dawn Cochran clarifies that none of her employees are working this overtime without pay and that her comments were misunderstood. “No,” Cochran gave a simple answer when asked directly if the rumors were true and went on to explain where the misunderstanding of words had taken place. Until recently, some employees of the office would arrive to work early and clock-in, but would focus on personal ventures rather than work related to the department. These employees had never been paid for this time, according to Cochran, but it made for confusion in looking at time sheets. “We made some changes. Lynn Doss gave us advisement and said what we would like for you to do is not let anybody clock in until 8 o’clock and don’t let anybody clock out until 5 o’clock” Cochran said of steps that have been taken to alleviate the confusion. The Tax Assessor’s office has been able to move forward despite the reorganization of the department. The work of the department from Jan. 1 of this year to present has accounted for almost quarter of all site visits since 2018. From 2018 to current the department has made 8,289 site visits, with 2,193 of these visits being completed in 2019. The department has also handled 233 Conservation applications or inquiries and have processed 241 Homesteads. Cochran updated the board on the changes made to job descriptions of each of the employees and the responsibilities that have been shuffled throughout the department, stating that there has been “a lot of give and take” and adding “everyone is working very good together”. The department is on track to continue its appraisal process through a three year cycle, and Cochran noted that because of the hard work of her employees the process of building schedules is becoming easier. “I’m very impressed with the staff and how they are doing under a stressful environment. They are doing fabulous,” Cochran said after informing the board that when she took over some schedule ratings were as low as 18 and through the work of her staff the ratings are now starting at 37. Cochran updated that the transition in mapping has had some bumps in the road, with Georgia Mass Appraisal Solutions & Services (GMASS) now handling mapping and rural land schedules, but her department working with the company to smooth out the process. The Tax Assessor’s Office is expected to mail notices on June 14 and will continue to update on work status at the regularly scheduled monthly meetings. 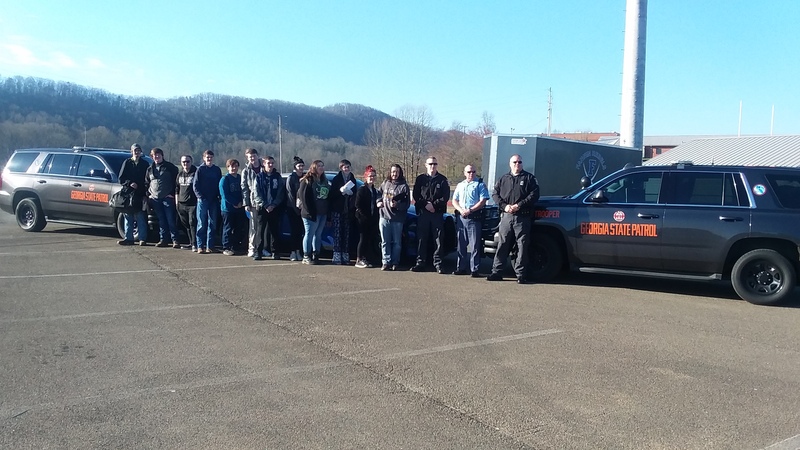 Students enjoyed local law enforcement making the material from Senior Math Finance come to life yesterday, March 21, at Fannin County High School. 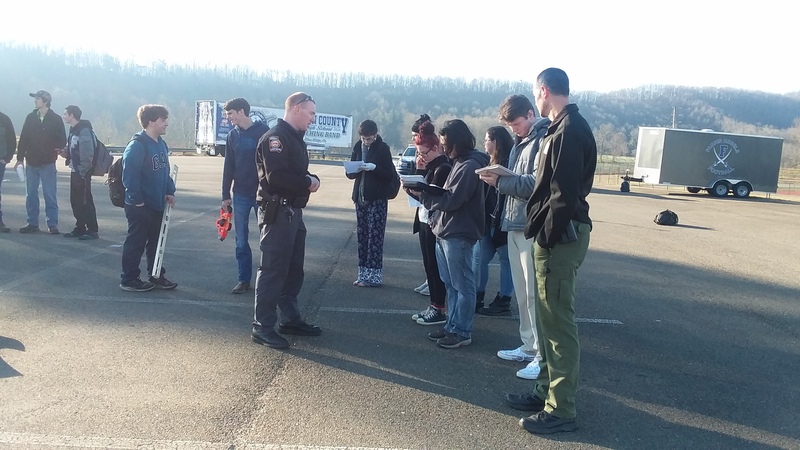 State trooper Andrew Phillips shared a power point and discussed how traffic reconstruction officers use mathematics to verify speeds, skidding distances and other relevant facts needed to reconstruct traffic accidents. The students then went to the visitors parking lot behind the football stadium to experience a reenactment of an emergency braking situation. They then used some of the formulas discussed in the classroom to determine the speed of the vehicle upon braking. Thanks go to School Resource office Darvin Couch, along with State Patrol officers Andrew Phillips, Scott Stanley, and Aaron Church. For the most part, north Georgia has had an abundance of rain this winter. As of the middle of February we had received over 12 inches since January 1st. As of the third week in February we had received over 15 inches of rain. Our average for the year is 62 inches, so if this pattern keeps up we will once again have abundant rain. Hopefully flooding has been minimal, but so much rain does bring to mind the importance of well safety. Wells that were overtopped by flood waters need to be flushed and tested for bacteria because of the potential danger of contaminants being washed into the well. Water from wells that has had a change in color as a result of the rain should also be checked. UGA Extension Water Resource Management and Policy Specialist Gary Hawkins recommends pumping and flushing a minimum of 2 or 3 times the well volume to clear the system. This water should be discarded from an outside faucet and not from an inside faucet to bypass the home’s septic tank. After pumping the water, the well should be shock chlorinated. The well should be flushed again until there is no smell of chlorine bleach and, like before, the flushing step should be done through an outdoor faucet to bypass the septic system. This highly chlorinated water, if discharged to the septic tank, could cause problems with the bacterial colonies in the septic tank. After the well is shock-chlorinated, flushed and the chlorine smell is gone (about two weeks), the well water should be tested for bacteria. Families can get their well water tested using their local county UGA Extension office for $46. Until the test for bacteria comes back, Hawkins strongly suggests that water for cooking or drinking be boiled before consumption. If the well still contains bacteria, the report will explain in detail how to treat the well. If you have any questions about this process or for more information on well water testing, contact me in the Gilmer County UGA Extension office.